Dentists have been using fillings for over a century now to repair teeth that have been negatively affected by serious fractures, cracks, or cavities. Several materials have been used for this essential restorative procedure over time, including gold, metal alloys, and dental amalgam. At Premier Dental Care, we now utilize composite resin, which contains no metal. Composite fillings can be precisely matched to your natural smile’s shade, ensuring an attractive and seamless result. What Happens When I Need a Composite Filling? 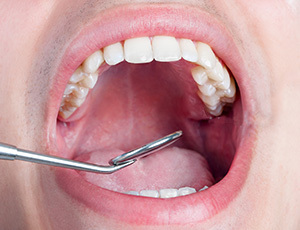 In most cases, receiving a new filling will only require a single appointment. Dr. Bakhtyari will carefully remove the decayed portions of your tooth, preserving as much of the remaining healthy structure as possible. Once the filling material has been applied and hardened in place, you will be provided with the proper care instructions. Composite fillings should be treated just like natural teeth with diligent brushing, flossing, and regular checkups every six months on average. Composite fillings are ideal for teeth that appear prominently in your smile. Patients should keep in mind that while this durable restorative solution should last for several years, they may need to be replaced in the future. In addition to treating decay, we may also recommend this service for rebuilding worn tooth enamel and even closing minor gaps between teeth. If you have any questions or concerns about composite fillings, consider contacting our Oak Hill, VA office for more information. We look forward to helping you achieve your ideal smile.